Greg Garnett knew something wasn't right. He told his wife, Cathy, he felt a sharp, searing pain in his chest and down into his legs. He thought he was having a heart attack. Cathy called 911, telling the operator her husband felt a heaviness in his chest. 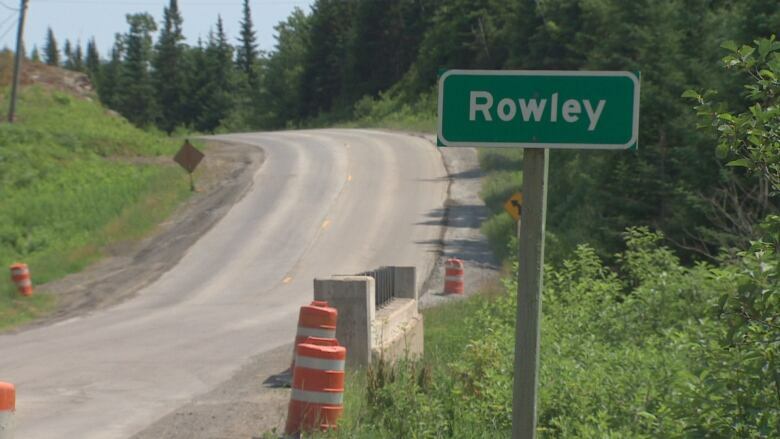 When Cathy repeated their address in Rowley, about 15 kilometres east of the Saint John Airport, the dispatcher replied, "The ambulance is on the way, OK?" It would take 45 minutes for the ambulance to reach the Garnetts' home the morning of April 28, 2017. But this is Cathy's account of that day and the few weeks Greg remained alive afterward. "I think about it every day," she says. Greg couldn't move his legs, and while waiting in pain for the ambulance, had fallen off the bed. The paramedics wanted him to get himself up and into the stretcher. He couldn't. And it was unusual for him to respond this way, says Cathy, since Greg, a former safety inspector, already had medical problems, including high blood pressure and a lower back injury, and dealt with pain every day. "Greg was a big man, he was 295 pounds and six foot four, so there was not much they could do," Cathy says. "I noticed they were only driving 60 kilometres," Cathy says. "And I asked the paramedic that was driving the ambulance, 'Should we not be driving a little bit faster? I did call for a heart attack?'" "The paramedic said it's nothing serious, it's just sciatica, he's going to be fine. And I thought, 'You know what? These people know what they're talking about. Maybe they're right.'" A nurse came into the room and asked the family to "shut him up," and Cathy, now joined by the couple's adult children, Beth and Greg, tried. "I was putting my hands over his mouth to try and muffle the sound so that they couldn't hear him," she says. "And I didn't do anything for him. I just let it happen because no one wanted to help us." The radiologist found a complete aortic dissection. The finding of a tear inside Greg's aorta woke the hospital up. "All of sudden, we go to the trauma section of the emergency room, and it's like a totally different story," Cathy says. "We have new nurses, they are doing things to him, they are putting stuff on him, lines are going in, and we are totally confused as to what's happening. Then this doctor comes into the room and he is dressed like a surgeon. "He told us Greg had suffered a full dissection and his heart was encased in blood and he had a zero to five per cent chance of survival, and that I needed to call family members and get my paperwork in order because he probably wasn't going to make it through the surgery." "We were so confused because for the last five hours we were told it was nothing, and all of a sudden my husband was dying," Cathy says. A dissection causes a sharp, searing pain in the chest and the neck, and it's one of the worst kinds of pain a human being can experience, says Dr. Francois Legare, head of cardiac surgery at the New Brunswick Heart Centre in Saint John. "It feels like a tearing, gripping, knife-jabbing, kind of pain," he says. "And it is very sudden. And people feel terrible. "It's very different from heart attack pain. Heart attack pain tends to be not so sharp or specific, heart pain is more pressure, dull, not really knowing where. This tends to be very sharp and very sustained." According to Legare, Garnett's symptoms were consistent with a dissection. A patient experiencing a dissection will also have elevated blood pressure and an increased heart rate. When the symptoms don't quite fit a heart attack, Legare says, the next thought for medical professionals should be a dissection. After surgery, Greg was sent to the ICU. When his kidneys failed, he was given dialysis. The prognosis was not good, according to Cathy. "We talked and we laughed," she says. "He told me he loved me. I rubbed cream on his feet. It was a lovely two hours. "I remember I went back to work, and I just was so happy because I knew when I left that we were going to get through it. I knew the man that I took to the hospital was going to come home. My Greg was going to come home." Around 4:35 p.m. Greg's heart stopped. "It was about two hours after I got to back to my work I got a call and he had coded." The dissection had moved into his carotid artery. Doctors worked on him for 35 minutes to try to save him, according to Greg's medical records, which Cathy shared with CBC News. "I just thought this is it — I'll never see him again. I'll never talk to him again. I thank the Lord he gave me that morning with him." "It was a good visit, I mean, but you always want more. And he was too young to go, way too young, I was a widow at 50, and he wasn't ready to go." 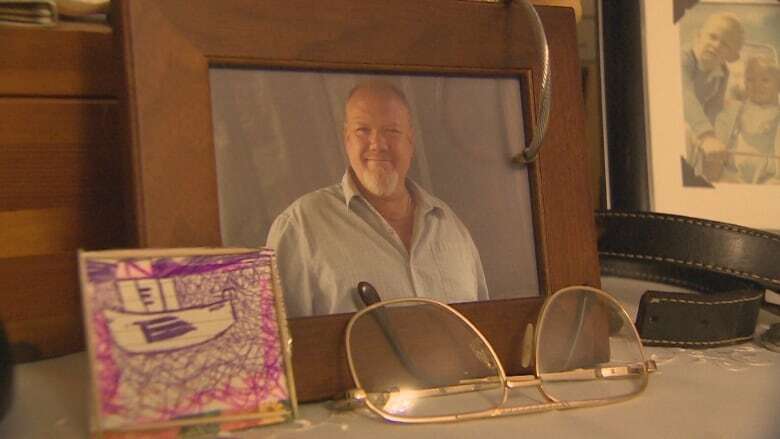 Greg's ashes are kept in the living room of the Garnett home. Atop the light-coloured wooden box are his glasses. Two Easter eggs in front of his picture were placed there by his two grandchildren. They haven't gotten over the loss, Cathy says, and Greg's experience after first suffering chest pains haunts them. "I think the part of what we suffered that day was so traumatic that we can't get past it," she says. Cathy says she doesn't understand why the paramedics and nurses who were there to help her husband didn't take him seriously, pay attention to his complaint and symptoms, treat him with dignity. "I'm here to hold them accountable for the way they treated him, the lack of treatment they gave him, and his chance of survival," Cathy says to explain why she wanted to share the story. "To see someone you love in that much pain for that length of time and be in a place where people can help and no one helped — it's like we were watching him being tortured and we didn't do anything about." ​At night, Garnett lies next to a picture of her husband. She plays an audio recording she found of Greg singing her song, "You've Still Got a Place in My Heart," by Ronnie Milsap, and she falls asleep. ​Cathy has met with senior management at both Ambulance New Brunswick and Saint John Regional Hospital but felt she didn't get the answers she needed. She was told no one would lose their job because of her husband's case, but it would become a learning tool. She's filed complaints with the Paramedic Association of New Brunswick and the Nurses Association of New Brunswick. Cathy has high praise for Greg's treatment once his dissection was found. She also admits the condition could have killed him even if paramedics and nurses responded differently. She just can't forget that his symptoms weren't taken seriously. "Greg was a good man. He wasn't belligerent with anyone. He deserved a lot more than they gave him. It was their job to look after him and they didn't." Nathalie Sturgeon is a reporter for CBC New Brunswick based in Fredericton. She is a recent graduate from the journalism program at St. Thomas University. She is from Blackville.